I am a writer, blogger, analyst and content contributor to StockBit Malaysia and KLSE i3Investor with more than 25,000 readers. I analyze stocks based on their fundamental and technical. In fact, I only choose those companies that their share price dropped drastically or share price potentially bottom out. Anyway, I have been in the financial markets since 2016 and have covered many sectors and companies which including Technology (Semiconductors); O&G; Construction, Consumers, and so on. Parkson Holdings Berhad is an Asian-based department store operator with an extensive network of 131 stores as of 2017, spanning approximately 2.1 million m2 of retail space across cities in Malaysia, China, Vietnam, Indonesia, and Myanmar. As of 30th December 2018, the group’s department stores network comprises of 46 stores in China and 66 stores in SouthEast Asia, including Malaysia (45 stores), Vietnam (5 stores), and Indonesia (16 stores). Note that, Parkson has ceased its Myanmar operation with the closure of its only store in 2Q19. 1. Outlook: South-East Asia market continues to remain challenging. Anyway, I believe that Parkson’s strategy of optimising its retail format, expanding its product and services offerings are gradually paying off as it is minimising stores losses via optimising store effectiveness and efficiency. Revenue is hovering around RM 3.7bil to 4bil for the past 5 years, but the company is making losses for consecutive years. Moreover, the negative profit margin is getting worse. First of all, its share price is still moving in a downtrend since the global financial crisis 2007-2008. Hence, it is super difficult for Parkson to break resistance one by one unless the business successfully transform. To identify is there any potential trend reversal in making, GMMA is applied by combining two groups of MA (short and long-term) with different time periods. If we monitor closely, we can see there is a potential the short term MA to crossover the long term MA. This indicating the short term downtrend might be reversed soon and hence offered us a trading or investment opportunity. In addition, I am looking at the Ichimoku Kinko Hyo. The conversion line (pink) is the fastest and most sensitive line and the baseline (light blue) trails the faster conversion line. Notice that conversion line follows price action the closest but baseline follows price action pretty well too. The relationship between the Conversion Line and Base Line is similar to the relationship between a 9-day moving average and 26-day moving average. Anyway, if you see Parkson's price action, we can see its share price had crossed the conversion line and baseline. Moreover, it touches the cloud (kumo) and potentially crosses it in the near term and change the overall short term downtrend from the blue cloud to the red cloud. On top of that, I did apply Fibonacci principles in this case but I did not attach it in the figure. Anyway, just a simple calculation by linking the recent low (23sen) to the recent high (27sen), some key supports are formed. They are 38.2% (24.5sen), 50% (25sen) and 61.8% (25.5sen). Now, we are at 25sen per share. Resistance: 28.5sen, 30sen and 35.5sen. FA perspective, business transformation is still undergoing, its either success or failure. 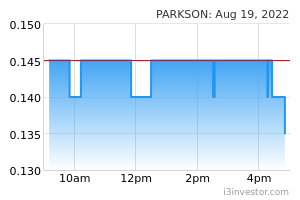 Every investor has a feeling and perception Parkson's transformation is going to fail and this is what had factored in and reflected in its share price. But what if, the business successfully turnaround? Imagine yourself the risk and rewards. TA wise, short term downtrend might be reversed but long term downtrend still intact. Long term downtrend only will be reversed if Parkson's fundamentals can support. What if Parkson's fundamentals cannot support? Trade instead of investing. Anyway, bear in mind, you not able to know the business is going to be successfully turnaround or remains a failure unless you are from the future. Good luck and happy investing. Disclaimer: Sometimes the smallest step in the right direction ends up being the biggest step of our life. This is not a buy/ sell call, it is just for education purposes. If you guys have any questions or want to have some discussions regarding on Parkson Holdings Berhad or any other sharing that I made previously, can reach me through email (patrick.thebull6@gmail.com). Parkson18 Thanks for the blog. Rewards is more than risk. Buy. enigmatic A wait and see approach would be better. 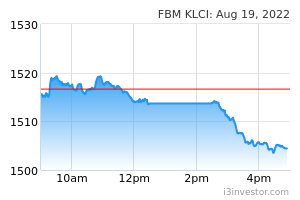 One more quarter in the red will hammer Parkson down to RM0.20. qqq3 been to a Parkson store or not? VenFx i like to buy my apparel everytimes in parkson, its always can save alot of time. the plus side of parkson is their household products are in better quality compared to other shopping outlet. Parkson always can entitled his retailers with the purchase discount in their next visit . Overall, parkson is its brand i trust. qqq3 how to fight Uniglo? VenFx uniglo biz model sama meh ? cant compete at all with parkson lah ! uniglo biz model sama meh ? kelvin61 Anyway, I expect Parkson to show profit in Q3. Short term traders are taking up position for a great return soon, cheers. Choivo Capital This article is honestly quite worthless. VenFx Haiyo, u sifu sifu gave harsh comments , me also feel shame to share my view and comments true my shallow article like that . Come back with better article and let sifu sifu here read till a wow ! Retail outlet like padini even lesser than mynews? Even 99mart & Diy is doing better than parkson. What is really wrong ? VenFx Is TTB still holding ? qps999 I was thinking to Hold...so hold..??? AKAD Sya fikir setiap org lain pandangan tentang perkembangan sesuatu syer..tidak semua bergantung dgn math but kadangkala bergantung dgn kelakuan prmbeli itu sendiri bagaimana ia manipulasi syer tersebut..perbandingan syer parkson dgn Dayang adalah sesuatu yg sangat jauh kalau dikira dari segi kategori syer, sangat bertentangan dari segi sifat pengaruhnya..
(2.6m shares buyback April ) Philip If you started by saying that parkson is a company valued at 267 million market cap, but has equity value of 3.7 billion, cash of 1.78 billion, net book value of buildings valued at 1.18 billion and much good will, then it would make a much more interesting position. If you told me that each time parkson sells one of its 44 department stores to h&m and zara it makes money, I'd be interested. If you started with the fact that if we were to liquidate the entire parkson we would make 4 times our investment cost at least, Id love to hear it. What is this technical mumbo jumbo and Japanese harakiri? I can't make heads out tails at all. Is it pertinent information other than to tell you everyone is bearish about parkson and not it's future value? has been renewed and extended to 18 December 2040. The other HGB will expire on 20 October 2028.
nckcm Nice statement uncle philip !